Posted on October 9, 2014 by Dave Kinskey Posted in 2014-Chicago The Musical	. The show dates have been scheduled for November 14, 15, 20, 21, 22, 23 and 29 at 7:30 p.m., plus an extra Saturday matinee on November 29 at 2 p.m. (Thanksgiving Weekend – two shows on Saturday!!!). Tickets will be available for easy, online purchase beginning on Friday, October 24, in addition to ticket sales at the high school activities office. Tags: blog, Chicago, Chicago The Musical, Moorhead, Moorhead High, Moorhead High School, Moorhead High Theater, old postings	. Posted on October 7, 2014 by Dave Kinskey Posted in 2014-Chicago The Musical	. “Chicago The Musical” will be performed by students this November by the Moorhead High School theater program. Set in Prohibition-era Chicago, the musical is based upon a 1926 play of the same name. The original play was written by reporter Maurine Dallas Watkins about actual criminals and crimes she reported on. The musical is a satire about corruption in the administration of criminal justice, plus the concept of the “celebrity criminal” in our society. Mark your calendars and buy tickets early! The show dates have been scheduled for November 14, 15, 20, 21, 22, 23 and 29 at 7:30 p.m., plus an extra Saturday matinee on November 29 at 2 p.m. (Thanksgiving Weekend). Tickets will be available for easy, online purchase as we approach the show dates, in addition to ticket sales at the high school activities office. 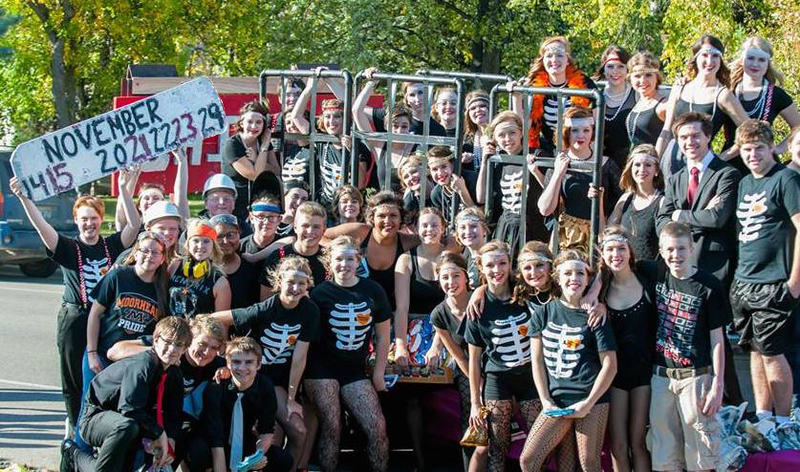 The cast of “Chicago The Musical” recently participated in Moorhead High School’s homecoming parade. Tags: Chicago, Chicago The Musical, Moorhead, Moorhead High, Moorhead High School, Moorhead High Theater, theater, theatre	. Now, in October of 2014, we’ve updated our website to be “mobile-friendly,” so that it will format well on smartphones and tablets, in addition to computer screens. We needed to start the blog fresh with the new design, so to read any older blog postings from 2010, 2011, 2012, and 2013, here’s a link to Moorhead High School Theater’s previous blog. The link will open in a new browser window. We hope you enjoy the new version of our website! Tags: 2010, 2011, 2012, 2013, 2014, blog, Moorhead, Moorhead High, Moorhead High School, Moorhead High Theater, old postings, old posts, posts, theatre	.